© Copyright 2018 CC Holdings, Inc. All Rights Reserved. CC Holdings was honored to support the Cancer Support Community's 2018 annual fundraiser—Laughing Matters—by giving away a pair of tickets to see Whoopi Goldberg! 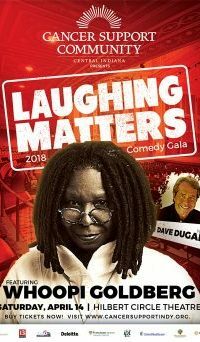 Cancer Support Community of Central Indiana welcomed Academy-award-winning actress, comedian and TV host, Whoopi Goldberg, as headliner for the 18th annual Laughing Matters comedy fundraiser. Donate online at cancersupportindy.org and be on the lookout for information about the 2019 Laughing Matters Comedy Gala.